I have lived within easy reach of the river Thames for much of my life and have paddled and come to know most of it almost intimately. But there had been a couple of stretches that had been consistently overlooked over the years – until last week. The river between Reading and Westminster is very well-known to me and – it must have been around ten years ago – I toured from the source (well Cricklade anyway) to Abingdon, and have returned to Oxford and other parts of the upper Thames regularly over the years. My experience of the river between Abingdon and Reading however was more patchy so when the idea of a trip from Abingdon to Marlow was first mooted at Marlow CC earlier this year I was keen. Not only was it an opportunity to fill in the missing links, but it was also a trip that my wife Liz was equally enthusiastic about and so soon became a date in our busy diaries. It was a leisurely trip, two full days paddling with a half day either side to allow for shuttling cars from one end to the other and almost 50 miles of river to explore in between. Campsites were pre-booked (wild camping not being encouraged in this part of the Thames valley!) and we set off from Abingdon in late morning sunshine to enjoy this rural section with Clifton Hamden’s magnificent brick bridge, stunning views of Wittenham Clumps and the tranquil Day’s lock. With plenty of time in hand we were able to explore the lower part of the Thame, making our way from its confluence with the Thames up to Dorchester and its ancient abbey. Having returned to the river, we camped at the marina at Benson where the Waterfront Café provide the excellent meal that hungry Marlow CC members expect. The next day took us into more unpaddled (by me) territory as we made our way down through Benson lock and passed Wallingford before stopping for a late lunch/early afternoon tea at the Swan at Streatley. The approach to Streatley had presented us with a glorious view of the Goring Gap and as we continued down to our campsite at Beale Park in the afternoon sun we were able to appreciate the full splendour of the ‘gap’ – one of the few places in the south of England where steep hills loom over the valley between. The camping at Beale Park was basic and we didn’t take much persuading to stop the next morning at Mapledurham lock to fill up on a second breakfast of sausage, bacon and egg rolls at its cafe. Mapledurham to Reading was another stretch of river previously unpaddled by me and another section not without interest particularly as we passed the fine and expensive-looking collection of riverside properties at Caversham. From Caversham and Reading CC I was back on (very) familiar territory and lunch was taken on the meadow outside the Waterside centre before the delightful diversions first down St Patrick’s stream and back via the river Loddon and then, before we reached Henley, the equally attractive Hennerton backwater. Our third night was spent camping at Henley and, as you will appreciate the importance of pubs, restaurants and tea rooms on this trip, I will mention that the Catherine Wheel in Henley high street provided us another excellent and value for money dinner that evening. 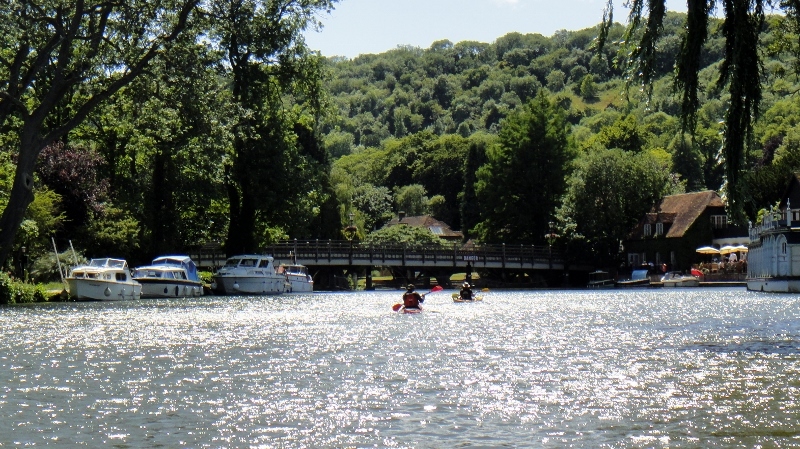 Our final day, the short paddle from Henley back to Marlow, was punctuated by a long stop for a Marlow CC favourite – coffee and cake at the Hurley lock tea shop. Four days, 48 miles and the chance to fill in some long-standing gaps along the way. The river Thames really does offer some excellent touring!